“Boom. End of Story.” – #DoubleFML FatDarrellPalooza! Follow me on social media by clicking the logos on the main menu! Anyway, welcome back to #DoubleFML FatDarrellPalooza! Exciting times here in The A (that’s slang for Atlanta for those of you who need an Urban Dictionary). Construction crews are in heavy prep mode setting up Mercedes Benz Stadium for Super Bowl LIII (and that means 53 for those who need a tutorial in Roman Numerals). The suspense is killing me! I’ve been checking my email at least 10 times per day…even the spam folder! It’s scary how these companies work lately though. You accidentally click one ad and you’re spammed for life! Actually, you don’t even have to click on it. You randomly think of something and suddenly Facebook and Google are all over you like a clingy ex girlfriend! That’s why I’m extremely careful with the internet searches I conduct now. Seriously, you’d better proofread before hitting that enter button! One typo and suddenly you’re getting flooded with Tampon ads and coupons! Although I haven’t gotten my Super Bowl schedule yet, my manager shared this great news with our team the other day! Aside from The Superbowl, we also hosted the Major League Soccer Championship game where Atlanta United came through with the victory! Although I wasn’t on the team the entire season, I still pulled my weight during the playoffs and I’m very excited for our crew! Unfortunately, that award is for our entire office, so my plans to wear it around my neck 24/7 like a Flava-Flav clock will probably never happen now. Bummer. Working the MLS Championship was cool and all, but following that up with working The Super Bowl a few months later would be epic! I’ve never even attended a Super Bowl before so we’re talking about bucket list material here. Hmm, although I’ve made my Georgia resident bucket list, I never completely thought through my life bucket list. Aside from career goals, the majority of my list would probably be filled with cities and countries I’d like to visit. In addition to the Super Bowl, I’d also like to finally attend a Mr. Olympia Bodybuilding competition (in the audience, not on stage)! I’ll have to finally put some thought into the rest of my bucket list though. The dozens of Life Insurance policy offers also flooding my inbox are a great reminder that I’m not getting any younger! What’s on your bucket list of things you’d like to do before you die? Comment Below! Before we move on, here’s some video from my other gig as a member of The Atlanta Hawks Flight Crew! Unfortunately, these videos may not be as “action packed” as previous versions since the anchors at Fox Sports South asked us to tone things down a bit when they’re on the air! So instead of random crazy dance moves, you’ll see us silently creep by while making marching band hand gestures. Jazz hands anyone? I also performed my song READY (Atlanta Hawks Anthem) for the crowd gathered outside of the arena before the game. Unfortunately, I don’t have the video footage of that performance, but the song should be available on all digital music platforms like Spotify, iTunes, Amazon and more by the end of the month. In the meantime, you can check out the track on Youtube by clicking here! So, last post I unsuccessfully attempted to find both the Carrot Cake and Dark Chocolate Oreos to try for you. Although the dark chocolate still wasn’t in stock, 1 out of 2 ain’t so bad (*if this were baseball). Check it out! If you’re new here, yes, I am a certified fitness trainer and no, Oreos are NOT good for you! Most of the taste-tests here are for cheat meals only. We do the whole yin-yang thing here. It’s “The Skinny with Fat Darrell” if you will. Anyway, with that disclaimer out of the way, let’s see how they taste! Whoa. If you like carrot cake, you’re going to love these! If you’re a regular here, you know that my bias always lies in favor of the OG original Oreos so none of these wild new flavors can ever unseat the champ. However, over the years, Oreo has absolutely perfected their flavors to the point that each smells and tastes exactly as advertised. These are no exception. The cream filling perfectly replicates carrot cake icing and the cookie even has a hint of cinnamon and nutmeg! I will definitely grab some ice-cold milk and destroy these on my next cheat day. They’re delicious! Someday, I’ll have to rank all the flavors I’ve tried so far. This flavor would definitely be in the Top 10. I’m impressed! Do you have another food item, restaurant or recipe we should all try? Tell us in the comments below! Also join our Foodie Facebook group, Phenomnomnomenal, by clicking here! Before we cue the music, I know you wanted a closer look at that t-shirt so, here ya go! …and yes, “adulting” is hard. On the opposite end of the health spectrum, allow me to bring a little yang to your yin with a brief fitness tip. I’ve been getting a lot of questions about the Keto diet lately. While I won’t dissect that entirely here, I will say that nothing beats balanced nutrition and exercise for long term results. Sure, tons of people are dropping weight with keto but the people who are most successful at maintaining those results, are the ones who know about macro-nutrients. If you never learn how to eat a properly balanced meal or how foods affect your body, you’re likely to gain all the weight back and more if you ever stop following the keto plan. Several people who’ve asked me about this diet aren’t following it correctly so it shouldn’t be a surprise that it’s not working! Keto seems to be a great shortcut but some of you are trying to take short cuts to the short cut! Again, I’m not necessarily suggesting you try this plan, but if you’re going to give it a shot, at least follow the rules or it’s guaranteed not to work! And if it’s guaranteed not to work, what’s the point? Do you have a fitness question, goal or accomplishment you’d like to share? Tell us in the comments below! Okay, well, I just realized that today IS my cheat day so I’ve got Oreos to eat! Do you have another song that fits today’s themes or that’s just so great we should check it out anyway? Tell us in the comments below! Before we go, let’s check out the next wave of “Foodie Holidays” that happen between this and next post! Bagels, popcorn and cheese? Yeah, it’s going to be a good week! January 23rd SHOULD be National Fat Darrell Day but the people over that the National Day Calendar website have failed me yet again! We may need to start a petition for 2020. Who wants to join the movement! Hopefully there’s only delicious food on the forecast this week and not snow. I only checked for upcoming foodie holidays and not the weather because, you know…priorities. Besides, this is what a typical forecast looks like so why bother? For those who were affected by snow though, hang in there! On the bright side, being snowed in leaves you plenty of time to catch up on our archives and to leave a comment before you go! The rest of you should comment too though, don’t be shy! Also make sure to sign up for our email list so you can be alerted whenever a new blog is posted. Although most will drop on Tuesday mornings, we’re mixing things up a bit this year. Anyway, that about does it for this week folks. Whatever you get into this week, I hope it’s incredible! Congrats on your opportunity to perform your song Ready for the crowd gathered outside the arena before the game! Every opportunity for exposure is a great one!! “You Go Boy” I just listened to it a few times and really enjoy it. Thank you! Yeah, we dance and perform around the arena – if you’re ever in the area definitely come one down to a Hawks game! It’s a fun time! Since I “luv carrot cake so much”…I am definitely going to get some carrot cake oreos. You always share such cool ideas. Thanks for sharing. Also, thanks for your fitness tips. That pizza shirt was made for YOU because I believe you are powered by pizza since it appears in some way in every post!!! lol The 2018 Operations Staff of the Year Award is really a big deal. I know that you contributed significantly in this effort. Kudos to you and the Crew!!!! If you love carrot cake, you’re going to love these Oreos! They taste just like the real thing!! 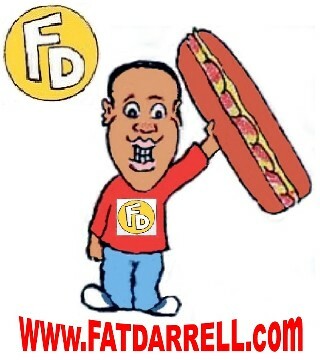 Count me in the movement for National Fat Darrell Day on January 23rd. Let’s get started!!! Get ready, get ready National Popcorn Day (January 19th)… here come Faith!!! lol Thanks for including your videos as a member of The Atlanta Hawks Flight Crew in this post. I enjoyed viewing them again and I especially love your song Ready that you created about the Team. Be sure to perform it every chance you get and I am glad you included it in Today’s Soundtracks!!!! I enjoyed this post! You gave me food for thought and I am now working on my bucket list. One thing I am hoping for is to win an expense paid trip to Super Bowl LIII. If I don’t get it, I will enjoy it on TV. haha However, while I am hoping that this will happen…and even greater hope is that you will soon be assigned to work the Super Bowl!!! Keep us posted. Yeah, I need to think through my bucket list too. It’s a fun exercise. That Super Bowl trip sounds awesome! Good luck! Hopefully I’ll be there too!